"Time signature, which is a blood test, is really a major breakthrough for my field and perhaps the first type of blood test that will have implications for how we treat and identify patients with sleep and circadian disorders." About 70 million Americans suffer from sleep problems such as sleep apnea, insomnia and restless leg syndrome. But physicians often miss circadian rhythm sleep-wake disorders. Everyone has an internal clock that produces circadian rhythms, intrinsic rhythms that keep a time of approximately 24 hours. They're not driven by light-dark cycles; instead, these rhythms are generated at a molecular level. This circadian clock system exists in every single cell of the human body and is regulated by a core clock genetic mechanism. There are also more than 10 “clock genes” that reside in the nucleus of cells and produce proteins that determine whether you are a “night owl” or “morning lark." Northwestern Medicine is home to the first circadian medicine clinic in the country. People come from around the world for treatment. Typical patients are younger adults who have had problems sleeping since their teenage years. Many cannot fall asleep until after 2 a.m. They can't wake up in time for school or work and many end up being diagnosed with mental health issues such as depression or anxiety. After a diagnosis, patients can be treated successfully with melatonin and blue light therapy. Zee was part of a Northwestern team that recently developed the first simple blood test to identify individuals' precise internal clock times as compared to external time. The test, Time Signature, requires only two blood draws. Previously, measurements this precise could only be achieved through a costly and laborious process of taking samples every hour over a span of multiple hours. The blood test could advance personalized medicine and help physicians determine the best time of the day for a person to take certain medications, such as blood pressure medication, and other medications that target "clock genes." The recent publication about Time Signature test is a a proof of concept, to show that it works, Zee says. The study was done in healthy young people; next it will move into patient populations. Rosemary Braun, PhD, MPH, assistant professor of Preventive Medicine in the Division of Biostatistics was the lead author of the study and Ravi Allada, MD, professor of Neurobiology at Northwestern’s Weinberg College of Arts and Sciences and of Pathology at Feinberg, was a co-author. The study was published in the journal PNAS. Read more about the study. Erin Spain: This is Breakthroughs, a podcast from Northwestern University Feinberg School of Medicine. I'm Erin Spain, executive editor of the breakthroughs newsletter. A good night's sleep is something many long for, but struggle to get Dr Phyllis Zee has dedicated her career as a physician-scientist to understanding circadian rhythms and improving sleep. She's the director of the Center for Circadian and Sleep Medicine here at Feinberg and a physician at Northwestern Medicine. She is also part of a Northwestern team that's developed a new blood test to help doctors identify circadian rhythm disruption in patients. Thanks for joining me today. Phyllis Zee: Thank you, Erin. Erin Spain: So more on that new blood test in a moment. But first I want to talk about sleep. So it's a fact. About 70 million Americans suffer from sleep problems. What are the most common? Phyllis Zee: Well, one of the most common reasons why Americans are not getting enough sleep is because they're not prioritizing sleep. It is in some ways, part of a very busy lifestyle and everything else becomes more important, and so sleep deprivation is pervasive and it's really estimated that most Americans are not getting enough sleep. On the other hand, there are many sleep disorders that are also rob people have a good night's sleep and for that matter of being able to function well during the day, so the most common ones are like sleep apnea, which is pretty common and it it does increase with age many of these sleep disorders, insomnia is probably the most common sleep disorders, so these are patients who have difficulty falling asleep, staying asleep or just poor quality of sleep, and then there's restless leg syndrome and one of the sleep disorders that physicians often don't think about or patients for that matter is circadian rhythm, Sleep Wake Disorders because they present like somebody who may have insomnia or somebody who may have what we call hypersomnia excessive daytime sleepiness, but it's actually due to an alteration or pathology in the circadian clock system. Erin Spain: The circadian clock system. How do you explain that to patients and people that come to you to be a part of your studies? Phyllis Zee: So timing is really crucial. I think timing is actually everything, right? So when you think about the circadian system, the word circa-dia means about 24 hours. About a day. So these are endogenous or what we would call intrinsic rhythms that kind of keep a time of approximately 24 hours. They're not driven by light-dark cycles, they're not external. And what we have found, and I think this is the coolest part of it all, is that these rhythms are generated at a molecular level. So genetics really regulate these circadian rhythms and they exist. This clock system exists in every single cell of your body. Erin Spain: You have actually found certain genes that are connected to the circadian clock. Tell me about that. Phyllis Zee: So the circadian clock system in cells and tissues are regulated by this core clock genetic mechanism. So very simply, there are these genes, let's call one of them, let's call it period gene. The other will be clock gene, but there's more than 10 of these genes and they reside in the nucleus. And what they do is how much of the protein that they're producing, how quickly these proteins get degradated, in the cytoplasm, they determine whether you're going to be an owl or a lark. So if you're an owl is because your clock genetic system is going taking a little slower than normal than the 24 hour cycle. If you're a lark is probably going a little faster. That's why larks wake up early because they finished that circadian cycle, that molecular circadian cycle a little faster than the rotation of the earth on its axis and the sun. Erin Spain: In the last decade. There's been some really fundamental findings in this field that have allowed others to see that this is beyond sleep. That the circadian clock really controls almost the entire health of the human body. Phyllis Zee: Yes, indeed. The Circadian Clock System exists in every cell, in every tissue of your body. And I think this is this fundamental discovery from basic science that has really changed the way we think about the role of sleep and circadian rhythms in health, so that if you alter circadian rhythms or there's pathology of that system and, or you're not getting enough sleep, it's not just going to affect your performance or how you feel, but indeed is going to affect broadly all tissues. The health, overall health, whether it's metabolic health, whether it's mental health or for that matter, just you know, your ability, your, your memory, your memory is affected, your ability to learn is affected is really the implications for health are quite broad. Erin Spain: Just last year the Nobel prize in medicine was awarded for the regulation of the Circadian Clock Gene. This is gone to a worldwide audience. Now people, and especially physicians are starting to understand circadian clock is important. Phyllis Zee: This is a major recognition for the field, getting the Nobel prize for the discovery of the genetic machinery, you know, of a how circadian rhythms are generating. So why would that be? Because the implications of that, finding that it exists in all cells has this broad implications for health and opens up an entire field, I think of medicine which I will circadian medicine, which is really beyond sleep. It is about how circadian timing and not just timing these circadian clock genes are regulating immune function. They're regulating the integrally involved in bioenergetics, metabolism. So, really the circadian medicine is about how can we use this timing information to increase precision of treatments, accuracy of treatments, but also how do we personalize it. I can't think of anything that is more applicable to personalized medicine than timing. Erin Spain: Can you tell me a little bit about your latest publication that describes a test called time signature? What is this task and what can it tell us about our circadian rhythms and internal clocks? 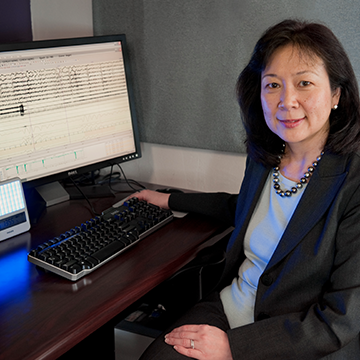 Phyllis Zee: I think time signature, which is a blood test, is really a major breakthrough for my field and perhaps a really, I think the first type of blood tests that will have implications for how we treat and identify patients with sleep and circadian disorders. The concept here is that these clock genes or just are regulating timing in all tissues of our body, whether it's in the pancreas, whether it's gut or lung and so forth. So then how do we tell internal timing versus external timing? So classically it's been really tough as a physician for me to say, Erin, do you have a circadian misalignment? How do I know that? How? I know that is by taking blood samples of every half an hour, every hour across 24 hours. This is what we do at Northwestern. We do great research in this area and we plot out a a profile and we say, ah ha, your melatonin rhythm is going up and let's say at 9:00 PM. So that's what we call a phase marker, but that's not practical. We can't possibly do that. Our patients, imagine that. So. So now this, this Time Signature test allows us to take a blood sample at anytime of the day and preferably, especially in, in this particular study, if you take it to blood samples about eight hours apart, we can now predict your molecular and your circadian timing within one point five hours. So I can tell you what time of the day that blood test was taken without knowing what time it was. Erin Spain: You said this is a major breakthrough. What was your team's reaction when you had discovered that you'd been able to shorten the amount of time and blood tests needed to get these results? Phyllis Zee: Well, it is a quest that we've had for a while because I think it is one of the major barriers for really taking circadian science and into what we call circadian medicine, to be able to practice. Because if a doctor out there just can't find a easy, practical and accurate way of determining what is your internal timing, now it's your clock timing outside, then now we can move the field forward. So for us that that discovery was just extraordinary. We basically say, Aha, this is great because this is a first step towards providing what I call a biomarker, a time based biomarker, for circadian timing and it isn't just for sleep. This really applies to diabetes, hypertension. So what I'm thinking is how can I tell a cardiologist, for example? And say maybe your patient's blood pressure is poorly controlled because their circadian rhythms are misaligned or their circadian system isn't functionally well. They're also not getting enough sleep. Well here, perhaps in the future we can say you can take a blood test and we can tell you whether the timing, the internal timing is mismatched with the external social, professional work and, or just light dark cycle, environment that the patient may be in. Erin Spain: And something that's really interesting as you may be able to help people figure out when to take their medication at the most optimal time because as you said, timing is everything, especially with medication and the medications. Phyllis Zee: Most medications, the common ones that we use with treat blood pressure and so forth, many of their targets are actually clock genes. This is a more recent discovery, therefore absolutely applicable. So now it's what we call crono-pharmacotherapy. So crono is really the clock, the timing issue. It applies to blood pressure medications because for example, let's say blood pressure, a very common problem or high high blood pressure, very common problem., you dip in the at night, it's nocturnal dipping. It isn't so much where your blood pressures during the day, but the lack of ability to dip during the night is associated with heart disease and it's also associated with better sleep. Right, so when you sleep, you're nocturnal dips, so would it be that you want to actually to take some of her blood pressure medications, depending on the mechanism of the medication, let's say at night. And whereas others you may want to take it during the day, but all of us are different. Some are owls, some are larks, so we can just say, hey, take it at 8 pm to be more accurate in this era of personalized medicine and precision medicine when we really want to know what your internal timing is so that we can maximize both, not just the effectiveness, but also decrease the side effects of medications? Erin Spain: How far away are we from having this and every doctor's office in the country? Phyllis Zee: Well, we're a bit far away still. I think this is really the first step, a proof of concept that we can really do this well. We need to move this time signature test is into patient populations now. This was done in fairly healthy young people, so we need to move that into patient populations. Clinical populations and test that and then we can train this algorithm the sample better so that it matches and it's applicable to each of these different patient populations, they're going to be very different. Age is going to have an impact on how accurate this will be, so there's still a lot of work in this area, but it's very, very exciting that we have this ability to do that and I think even more importantly, this paper was about using gene expression data, which of course is a little harder to do in clinical practice, but the beauty of the time signature is that is that that's why it's called a universal method because it can be applied to any type of Omix metabolites, for example, from the blood, proteins and metabolites are much easier to get. You can get it from blood very easily. So that's the future of where we're moving forward to is applying this time signature to other types of samples from blood and also in different populations. Erin Spain: And tell me where was this paper published? Phyllis Zee: The paper was published in PNAS, which is the proceedings of National Academy of Sciences. So it's, you know, it's, I think it really speaks to the importance, uh, of the, of the finding and, and really has implications for the future. Erin Spain: And you have an excellent team at here in northwestern across departments who are studying circadian rhythm and a lot of people contributed to this particular blood test. Tell me about that. Phyllis Zee: Northwestern is quite unique actually in the sense I tell people this all the time that sleep and circadian biology and medicine is high on the list here and in this quite prominently featured. And so there we have a center for circadian and sleep medicine, which really integrated cuts across departments and perhaps even in also schools within northwestern university. And there are really a large number of people in all departments in Feinberg that are involved in sleep. And our circadian research, there are not necessarily sleep doctors. They're really in their own primary departments. For example, a good example is this research, is one example. Where Rosemary Braun, who is the lead author, she is in the department of preventative medicine. She is a biostatistician and the physicist, so she is a big, she's a data scientist, which is just an amazing thing these days. And then we have Ravi Allada who is in the north campus or in the Evanston campus who is a basic scientist who does work with flies, but also is a physician scientist who has a great interest in looking at these time signatures. So in some ways it was his idea to come up and say, we can do this. And I said, absolutely, you know what, this is what I need clinically. How can we, as I said earlier, how can we get a blood test that a physician in the future can use to identify internal timing. So it is a very highly collaborative role. We also have really a talented young junior faculty in the sleep medicine division in Feinberg, like Sabra Abbott and Kathryn Reid. They really did the hands on work. Imagine collecting blood every half an hour right from these individuals across several days and doing all of that. So those are, it's really a great team effort. Erin Spain: You spend a lot of time in the clinic seeing patients, when people are at the point where they come to see you in the clinic, what's going on with them and their sleep? Phyllis Zee: Being a physician-scientist is really one of the differences that I feel that is unique is that we actually do see patients and I like to think of it this way, that so you can, you can look at basic science findings and see how they may contribute to disease. I take my inspiration actually from patients and I think why can I not fix this? Why am I limited? And so it goes both ways. Take the basic science knowledge, apply it to the clinic, but also they inspire me to ask the questions. And this is exactly an example of that because I'm frustrated. I can't tell a primary care doc how to tell how to identify circadian timing because I can do it, but it's too difficult for others to do it and therefore that's the inspiration. So really does help. What do our patients come complaining about? So we have a the first circadian medicine clinic in the country. Phyllis Zee: It's a new field. This we established it in 2014, certainly recent. Fairly recent, and it is a model system is a model clinic. So we also now provide telemedicine for circadian disorders because it was thought to be rare. It's not rare and we get patients from all over the country and sometimes all over the world who come to see us specifically because they've gone everywhere and they don't know what else to do and now the word is getting out that there is this clinic at Northwestern and and physicians are referring these patients to us. So they come. Usually that can be usually younger adults who have had problems since her teenage years. They can't fall asleep until very late until 2:00, 3:00, 4:00, 5:00 in the morning. They can't wake up in time for school. They can, you know, as a young adult, they can't get to work on time and many of them end up getting a comorbid mental health issues as well, like depression and anxiety disorders and some of these individuals, not only are they late, but they can't actually keep a ingrained rhythm. So every day their clock drifts later and later and later. So you can imagine. It's like they're, they're, they're slightly out of control, totally out of control and these are individuals who, whose life are really effected, terribly --- relationship and work at everything. Everything. And that is why the quality of life and that is why they come from all over the country because they're fairly desperate. And I think this is something that for me it's like being a kid in the candy store when I see these patients and I know I can help them and I give them hope. It's fun. And when I actually see physiology in play, like I said, I think your melatonin rhythm is going to be at 4:00 AM instead of 9:00 PM. Let's sample this. Let's take a look at this and it comes back pretty much like this and you've got it. And I go like, Ha, you feel like you just every day you're discovering something. Erin Spain: And then how do you help them? How do you treat them? Once you discover, you can pinpoint exactly what's happening. Phyllis Zee: So the circadian clock system a runs a genetically at about 24 hours, but it's not exactly 24 hours. So we need to keep that rhythm in 24, the strongest time giver, or we also call it cy giver for the word time giver is light. We live in this light dark cycle. It doesn't matter whether your plant or single cell organism, you reflect it in this. So light in trains that clock shifts the timing of the clock. It accelerates and decelerates the timing of this molecular rhythm so we can. So let's say somebody is delayed, they come in, I can't fall asleep until 3:00 o'clock in the morning, can't wake up. What they need to do, so we need to do is get that clock to run a little faster, right? So we need to advanced or timing, we need to get them to sleep earlier and to wake up earlier. So we will give them light in the morning, in the early morning hours of their biological time. Erin Spain: A physical light? Phyllis Zee: A physical light. So these could be light boxes, they could be these goggles that we have and we've all, not we, but the field has discovered that the circadian clock system responds to light, but a special type of light, the shortwave length or blue light is much more powerful and that I would say you can be visually blind, but not circadian blind. That's how important the system is. Because special receptors in the retina called the retinal ganglion cells, but the receptors are melanosomes receptors. They are most sensitive to short wavelength of blue light. And then they send signals directly from the retina to the hypothalamus, to the area of the master clock, which is a suprachiasmatic nucleus. So it's really, it's. It's something that is so important that from an evolutionary standpoint, it's been conserved and so light so we can use timing of light, we can use also melatonin and melatonin is the opposite of light in some ways. It is the brains and body's dark signal, so you use light, so you're telling the individual this is day time because their clock thinks it's night time. We really are changing the the expression, the timing of the expression of these genes and were also then able to align the internal rhythm with that of the work rhythm, the work schedules as well as the light-dark cycle. Erin Spain: So it may be light in the morning and then at night they'd take a pill with the melatonin. Phyllis Zee: Absolutely. The melatonin is a dark signal light as a light signal. And then one of the more recent findings is the role of both exercise and feeding. So when you get more light during the day, you also can be more active during the day. And we know that physical exercise can also change the timing of the circadian clock system. Is not as powerful as light. Light is by far the most powerful, uh, it can also do that. So all of these things are important. And feeding. It isn't how much you sleep only that is important is when you sleep. It is not how much you eat that is important, it is when you eat. And this is I think what's happened the last five years or so, that gives us even new ways, innovative ways, of treating these patients. We'd not just do a light and melatonin or light. Now, we really have to pay attention to when they're exercising, if they're exercising, and then also what they eat. But more importantly, when they eat. Most of these individuals who are, let's say delayed sleep phase, they tend to eat very late. They eat like, you know, at midnight, they eat at 1:00 AM. And what is that telling your clock? You're your metabolic clock system? It's daytime! So all of these begin to play a role and much of this as as as you know, as behavioral types of therapies in as well as pharmacological. We just don't have a drug right now yet that is pinpoint and say this is a circadian drug other than melatonin and melatonin-like substances and, and there are and those are very, very useful. Erin Spain: What you're describing our therapies for someone who actually has a circadian rhythm disruption, but for normal, healthy people someday, would they be able to pinpoint their perfect time to exercise or to eat or to sleep to have optimal health? Phyllis Zee: Yes, indeed. We hope that this time signature will be one of those types of tests and as it evolves, I think it could be like a metabolite. Maybe we could even get it from urine or saliva. We may not need to get it from blood, although of course it's going to be more accurate from blood. So I think moving forward, that is the idea that, you know, this is the first step. We want to be able because circadian biology is so important and integral for health, not just how you feel and not only about sleep is about metabolism, is about cardiovascular function. We've even more, you know, our field has recently discovered that alterations in circadian rhythms is a early risk factor for the development of neurodegeneration and perhaps even Alzheimer's disease. So the implications are for healthy aging just for healthy behaviors, but also how we can use these time based test to identify early risk factors in patients.